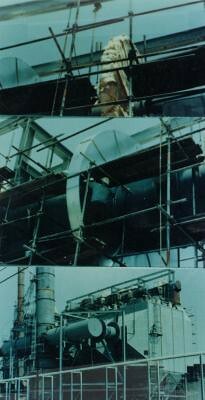 The three pictures above show thick wall expansion joints being installed in a Texas refinery. Workers are covering the expansion joints with insulation, then covering the insulation with aluminum. The 72” expansion joints, which are fabricated from 1/4” carbon steel plate, have a 10” convolution.